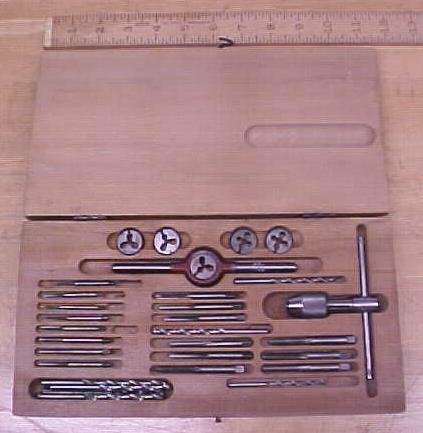 This is nice clean tap and die set in a fitted wood box that is not marked by the maker, however it contains a die wrench marked " O.K. MADE IN U.S.A. NO. 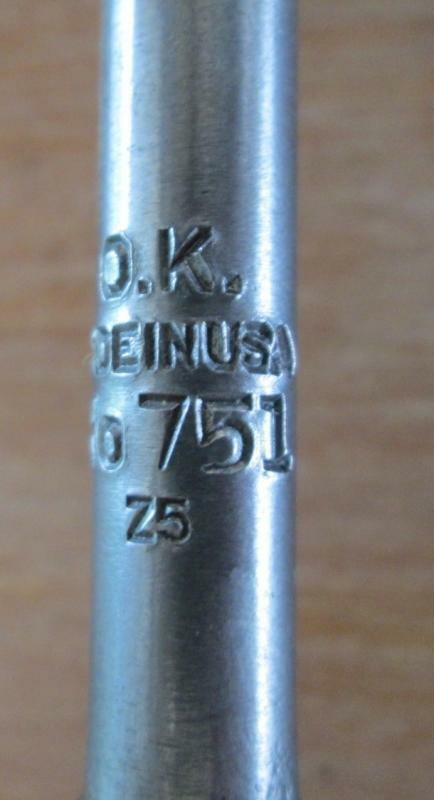 751" and a tap wrench marked "NO. 328 GTD MADE IN U.S.A. 27". 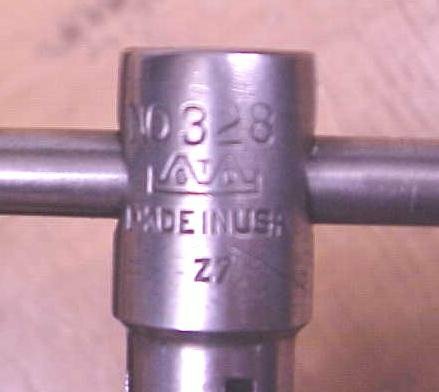 Most of the taps and dies are also marked "GTD" and the various size that they are on them also. The sizes of the taps are from(3-48 to 1/4-20)these are the tap sizes: 3-48 (2), 4-40 (1), 5-40 (2), 8-32 (3), 10-32, 10-24 (2), 12-24 (2), 1/4-20 (2), 1/4-28 (2), as you can see there is more than one of some of the taps. The adjustable round dies, are (3-48, 5-40, 8-32, 10-24, 12-24, plus over 6 different tap drills are also included. All are in the wood case, in various pockets cut in the wood box. 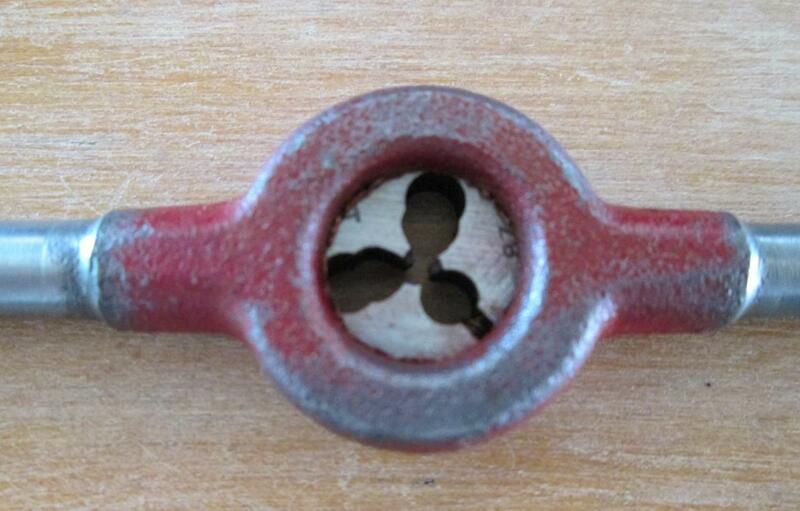 The set features a very nice quality tap wrench, a good sturdy adjustable guide die wrench. 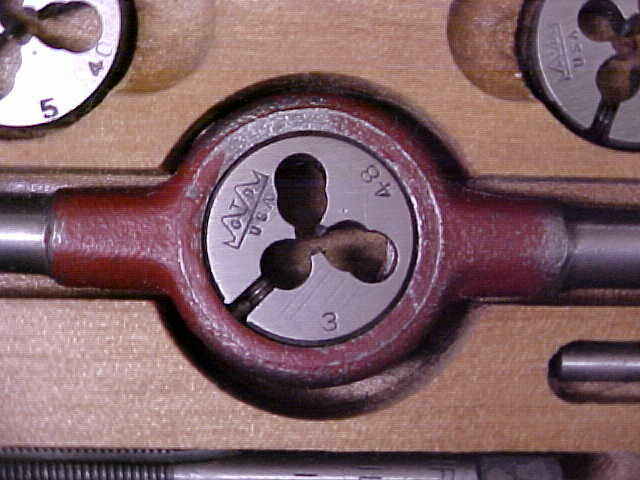 All the taps and dies appear to be in Good+ to fine condition, and the wrenches are in very good condition. The wood case is solid, no damage, minor finish wear, good hinges, and front latch closure. Overall one of the nicest vintage small sizes tap and die sets I've seen, as most of the pieces are marked and appear to be the originals, plus most sets do not have drill bits like this one does! Very complete, very good quality! A rare set in this nice of condition! All the drills, taps and dies are in very good condition, many show no sign of use! The case is 6 x 11.5" with a good latch and hings. 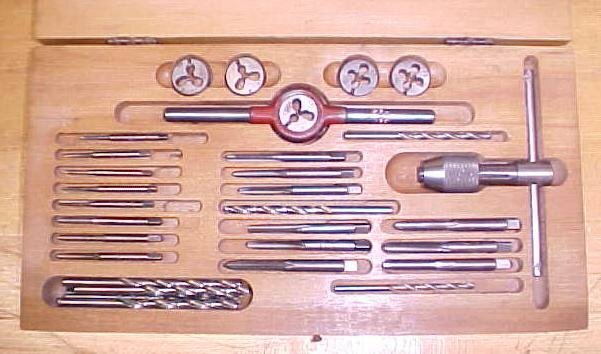 Items Similar To "Greenfield Tap & Die Stock Set w/Case Small Sizes!" Wiley & Russell Tap & Die Stock Set w/Case Small Sizes!